Taking online music lessons at ArtistWorks is an unparalleled experience. We have the most comprehensive an accessible lesson libraries taught online by 30 of today's most celebrated musicians. Investing in our industry unique learning platform will transform your playing forever and help you become the musician you’ve always wanted to be. Don’t just take our word for it, check out the video below and see how we have helped students from all around the world improve their playing. Come see what you’ve been missing, get in and #jointhejam. Having the best online music instruction platform is one thing, but hearing how it helped our students become better musicians is everything. That’s our jam! In honor of these fabulous testimonials, we want to offer you a sample of what sets us apart from the rest with free online lessons taught by the master musician of your choice. We have over 30 instruments and genres to choose from for players of all skill levels. Our courses are taught by world-renowned musicians who are leading figures in their respective genres. Powered by our patented Video Exchange Learning platform, our lesson libraries are all-inclusive, affordable, and interactive, something you can’t find anywhere else online. By clicking HERE, you will receive lessons that have been hand-selected from the instructors extensive, online lesson library. Gain valuable understanding of the course your are sampling along with our Video Exchange Learning technology which features real-life video feedback between students and their instructor. Try some free sample music lessons from the course of your choice by clicking HERE and see if we can become your favorite music education destination online. 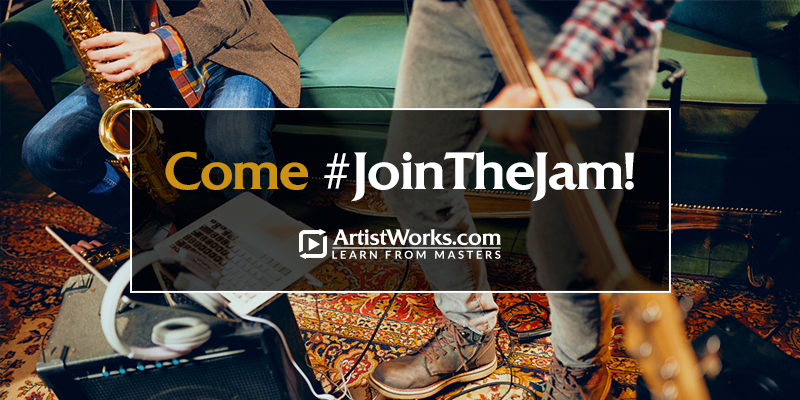 We want to hear from you, we invite you to come #jointhejam.